The following considerations are taken from a conference given by Prof. Plinio Corrêa de Oliveira. 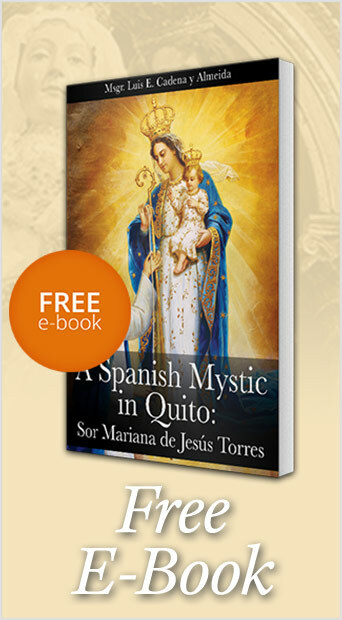 They have been translated and adapted for publication without his revision. –Ed. Although not an exegete, I naturally try to reason things out. Knowing that nothing happens fortuitously in the New and Old Testaments, it is according to the good rules of exegesis to ask why Our Lord fell three times. This was not mere chance, like a plumber who falls three times while carrying a very heavy pipe. He fell once because he stumbled on a stone, another time because he was really tired or a third time because he was lazy. It was not something accidental. Since Our Lord fell three times, the number three must correspond to high considerations and elevated reflections about weariness, suffering and even the number three itself. 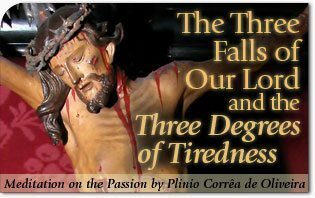 Therefore, I will try to draw conclusions from the fact that the tiredness of Our Lord Jesus Christ was manifested in three falls as He carried His Cross. I cannot investigate this matter as an exegete, but rather as a reasonable man with common sense. Clearly, there are two forms of tiredness. One is illegitimate, which Our Lord did not have. The other is legitimate tiredness that Our Lord did have. Illegitimate tiredness exists when a person lacks love of God and carries his burden unwillingly. This is the tiredness of the slothful. For example, a man who is accustomed to sleeping twelve hours a day, wakes up tired and spends the whole day tired, because he is lazy. Obviously, Our Lord never had this tiredness since He was Perfection Itself. When common energies become exhausted, common experience teaches us that there is also the tiredness of an active or dedicated man, which has three degrees of intensity. There are also three corresponding degrees of exertion and human resistance. Thus, it is reasonable to imagine that these three degrees relate to the three falls of Our Lord. The first degree of tiredness is when a man carries a burden until all his common energies are exhausted and falls under its weight. The very act of falling causes him to recover a bit and he has a second inspiration, whereby he mobilizes his more profound energy. Admirably controlling his body, he calls upon all the latent strength inside him. Although not accustomed to mobilizing this energy in daily life, he harnesses it and forges ahead. Thus, there is a second mobilization of the soul’s energy. The soul makes a greater effort and moves on until the next fall: the second degree of tiredness. The Soul Makes Use of All It Has and Falls Again. Observing himself more closely, groping honestly through his energy reserves, he finds that there is still something left to sacrifice. His prayer has been answered. Besides the energy of which he was unaware, he finds new supernatural strength that permits him to continue. He rises a second time and advances, supported more by the angels than by himself. He realizes that there was something more to give. Though unable to walk, he can still drag himself along. He has decided to accomplish his mission, even if he has to ask God for a miracle. He gets back on his feet and walks. In so doing, he gives something from the very depth of his being that he never imagined he possessed. He exhausts what truly is the last breath of his soul and performs the most complete act of love. Only then, when he gives himself entirely does he attain the clearest vision of his ideal. He rises from the third fall, and takes a few more stumbling steps to arrive at the place of sacrifice. There, he is nailed to the cross and utterly immolated. These are the three degrees of tiredness, which correspond to the three stages of human dedication. In the first stage, one expends the energy that he knows he has. He asks for Our Lady’s help and the common assistance of grace. In the second stage, he expends energy he scarcely thought he had and asks Our Lady with greater insistence to send special help, because he doubts that he can continue to walk with only the common assistance of grace. In the third stage, he gives something far beyond what he thought he had. He finds a capacity for dedication and effort, beyond what he thought was possible. He advances amid total darkness, more by a miracle and absolute faith, than by any natural means. Nevertheless, he continues to move forward. Finally, he fulfills his mission by a truly miraculous action. He is completely united with the supernatural. To the degree that he rises after each legitimate fall, man increasingly exudes the beauty of self-denial. This increases his capacity to attract others, because men loath egoism and flee from it. Men only follow those who deny themselves. Thus, only the man who has reached this ultimate point of self-denial and given all he can, is ready to attract souls. This is why Our Lord, after having fallen three times, was ready to be shown to all peoples from the height of the Cross. He had already passed through this interior immolation. He had been despoiled of everything. Still, the inexpressible sublimity of the Crucifixion takes place after the sacrifice is made. Our Lord had already carried the Cross all the way to Calvary and there, with even greater pains, allowed Himself to be crucified. His suffering increases until the moment He pronounces the “Consummatum est.” However, with the Crucifixion, He ceases to carry the Cross. From the moment He is nailed to it, the Cross carries Him. There are stages in the spiritual life of every man, where he must carry his cross. Moreover, at times Our Lord calls man not only to accept what befalls him, but also to seek out what is terrible, tragic and apocalyptic and advance towards it. Only then, is he ready to go where Our Lord wishes. Then, he is ready to be nailed to the Cross and unite himself with Christ for all time. Therefore, there are two stages and three dimensions of suffering. The first stage is to meet the Cross. The second is to let oneself be nailed to it. In the first stage, man goes to the apex of renunciation, successfully despoiling himself. In a second stage, having arrived at the apex of renunciation, he disposes himself to remain in it throughout his life and the cross becomes his support. This entry was posted in Plinio Corrêa de Oliveira and tagged a, and the three deggrees of Tiredness, angels, articles, exegete, exertion, first degree, is, lazy, legitimate tiredness, meditating, New and Old Testament, of, of Our Lord, Our Lady, Passion, perfection, Prof Plinio, summarized, the, Three falls, tired by Plinio Corrêa de Oliveira. Bookmark the permalink.